Biography of High Renaissance Italian Architect, Painter. Regarded as one of the greatest architects of the Italian Renaissance, Donato Bramante (Donato di Angelo) was considered by his contemporaries to have restored the true principles of ancient architecture, and is acknowledged today as the founder of the High Renaissance architectural style. Under the patronage of Pope Julius II (1503-13), artists like Bramante, Michelangelo (1475-1564), and Raphael (1483-1520) renewed the artistic greatness appropriate to Rome as heir to the Roman Empire and as the centre of Christendom. The city's heritage was symbolized by Bramante re-designing St Peter's Basilica as "the dome of the Pantheon over the vaults of the Temple of Peace". Although much of his life was devoted to fine art painting, he was the creator and greatest exponent of cinquecento Renaissance architecture, and therefore an important contributor to Renaissance art and culture. NOTE: For more about Florentine Renaissance architecture, see: Florence Cathedral, Brunelleschi and the Renaissance (1420-36). see: Old Masters: Top 100. Although we know almost nothing of his early life, Bramante was probably trained as a painter in Urbino, near his birthplace. At the court of Federico da Montefeltro he could have met Leon Battista Alberti (1404-72), Piero della Francesca (1420-92), and, most important as an architectural influence, Francesco di Giorgio, as well as De Architectura by Vitruvius. His first certain work, the facade painting of the Palazzo del Podesta, Bergamo (1477), already demonstrates an interest in architecture, as well as in perspective illusion. A signed engraving of about 1481 contains many elements which were to appear in his buildings in Milan, where he was by then living, attracted, like Leonardo, to the court of Lodovico il Moro. Leonardo's architectural drawings, the early Christian churches of Milan, and the logical harmonies of the buildings in Urbino, were the formative influences on Bramante's architecture. Alberti's Mantuan churches are also reflected in Bramante's first church, S.Maria presso S.Satiro (1482-6). During his work on this building it developed from a simple rectangular oratory to a Latin Cross basilica with nave and aisles. Site restrictions forced him to truncate the choir into a trompe-l'oeil backcloth, using the perspectival skills of his painter's training. The sombre monumentality of the nave, with its massive arch and pier system and illusionistically coffered barrel vault, owes something to Alberti's S.Andrea. The tribune at S.Maria delle Grazie (1493) was commissioned by Lodovico Sforza as a huge family mausoleum. The plan is like a gigantic version of the Old Sacristy by Brunelleschi, with semicircular apses added on three sides. The uncluttered articulation of huge spaces foreshadows Bramante's mature Roman works. His other Milanese work was at S.Ambrogio: it includes the elegant Corinthian loggia of the Canonica (1492), with its bizarre tree-trunk columns at the corners, and the Doric cloister (1497-8), whose upper story suggests a first-hand knowledge of examples from ancient Roman architecture as well as examples from Greek architecture. From 1488 he was consulted, as were Leonardo and Francesco di Giorgio, about the rebuilding of the Duomo at Pavia. At Vigevano (1492) he designed the town's central piazza, whose arcaded sides were painted with illusionistic frescoes. By 1499 the French occupation of the city of Milan had forced Bramante to Rome. Taken up by the entourage of Alexander VI, he first designed the cloister of S.Maria delia Pace. More consistently antique than his S.Ambrogio cloisters, it retains the graceful linearity characteristic of Urbino. The commission for the tempietto at S.Pietro in Montorio followed. Despite the inscription dated 1502, the masterly design of this tiny round church has often earned it a later dating. The first Renaissance building to employ correctly the full Doric order, it was inspired both by the column-encircled temples of Antiquity and by Francesco di Giorgio's architectural drawings. Bramante's "House of Raphael" (Palazzo Caprini, now destroyed) probably also dates from before 1505. Built in the new street leading to the Vatican, it provided a perfect model for the small palaces needed by the expanding papal bureaucracy. Its sequence of rusticated ground floor with shops and applied Classical orders on the first floor influenced domestic architecture up to the 20th century, as did its innovatory use of stucco-covered brick. Bramante was to become the architect of Pope Julius II's plan for the renewal of Rome. It began at the Vatican, where he connected the palace and the Villa Belvedere with an ascending series of courtyards flanked by arcaded corridors. From the papal apartments a perspectival vista (now interrupted by a library wing) ran through ramps and fountains to an exedra at the uppermost level. While its axiality recalled the ancient temple complex at Palestrina, the symbolism of the Cortile del Belvedere (1507-7) combined overtones of Roman villa and theatre. 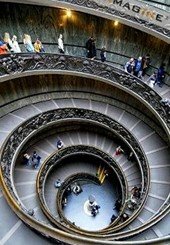 See: Vatican Museums. See also: Raphael Rooms (Vatican). Julius II's most optimistic project was to create a new St Peter's Basilica to replace the old Constantinian building. The foundation medal and Bramante's "parchment plan" give some idea of the unexecuted first project: a vast Greek Cross with four subsidiary crosses and corner towers, it recalled Leonardo's centralized church plans. The single-shelled Pantheon-type dome was to be supported on four great isolated piers of original and influential design. Work began on these piers, and by Bramante's death in 1514 they had been vaulted with crossing arches, and a choir had been built, using the 15th-century foundations built for Nicholas V. A giant pilaster order - Doric on the exterior, Corinthian on the inside - gave vertical unity. The urban design plan for the new Rome extended beyond the Vatican. Across the river in the old city Bramante built a new street, the Via Giulia, to be dominated by a colossal Palace of Justice, of which only the rusticated base was executed. The church of S.Celso (now destroyed), a small scale version of the first St Peter's plan, was begun (in 1509) on another new street, the Via de' Banchi. The tribune of S.Maria del Popolo (1507-9) remains relatively unchanged. Here Bramante added a funerary chapel and choir to an existing church. The coffered barrel vault and simplified shell niche apse are a stripped version of the destroyed St Peter's choir, and the square tomb chapel is lit by the so-called "Serliana" windows invented by Bramante. As the great art-writer and architect Giorgio Vasari (1511-74) realized, the ambition of Julius II was necessary for the fulfillment of Bramante's architectural genius. Their joint enthusiasm for destruction and renewal earned the architect the nickname "Bramante ruinante", and in a contemporary satirical dialogue the dead Bramante is heard outlining to St Peter his plan for the redevelopment of heaven.  For profiles of the great artistic movements/periods, see: History of Art.